Background Early identification of clinical deterioration is critical in providing high quality care to hospitalized patients. Having invested heavily in electronic medical records, hospitals are leveraging EMR data to address failure to rescue occurrences. The Rothman Index (RI), an acuity score which provides a graphical view of patient condition using EMR vital signs, lab results and nursing assessments, can be used to monitor patient condition. Objectives To determine if risk-adjusted mortality could be decreased with implementation of a nursing SWAT team, using RI graphs, to identify clinically deteriorating patients at a 350-bed hospital campus. Methods Each shift the SWAT nurse reviewed the RI graphs of all adult medical-surgical patients and pro-actively rounded on patients with the lowest or sharply declining scores who were not in an ICU. The study had a 6-month control period and a 9-month intervention period. A second control was provided by a sister campus for the 15 month period. Results Mortality fell from 1.9% to 1.3% (p<.001) in a patient population of 24,637. 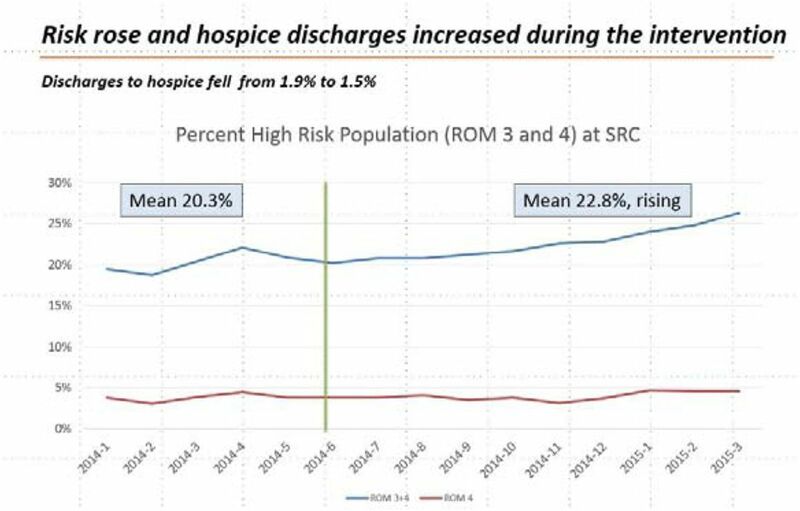 The percent of highest risk patients (admit APR Risk of Mortality 3 and 4) increased (20.3% to 22.8%) and the percent of discharges to hospice decreased (1.9% to 1.5%) during the intervention period. The mortality at the sister campus remained steady at 2.3% (population 55,991) during the 15-months. 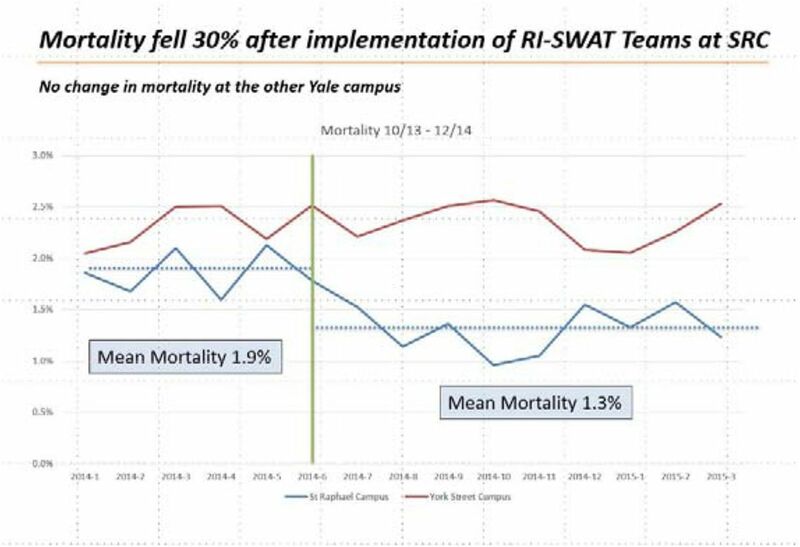 Mortality at two Yale campuses — 15 months. Mortality fell from 1.9% to 1.3% from the control to the intervention period (blue line). The mortality at the sister hospital was unchanged at 2.3% (red line). Risk of Mortality at SRC (intervention campus) — 15 months. While mortality fell, risk of mortality (Admit APR Risk Model) increased from the base period to the intervention period. In this model risk increases from ROM 1 to ROM 4. Typically, ROM 1 has a mortality rate of <0.1%, ROM 2 about 1%, ROM 3 about 5%. ROM 4 about 25%. ROM 3 and ROM 4 rose from 20.3% of hospital patient population to 22.8%. ROM 3 plus ROM 4 is shown as a blue line. ROM 4 alone is shown as a red line. Discharges to hospice also fell from 1.9% to 1.5%. 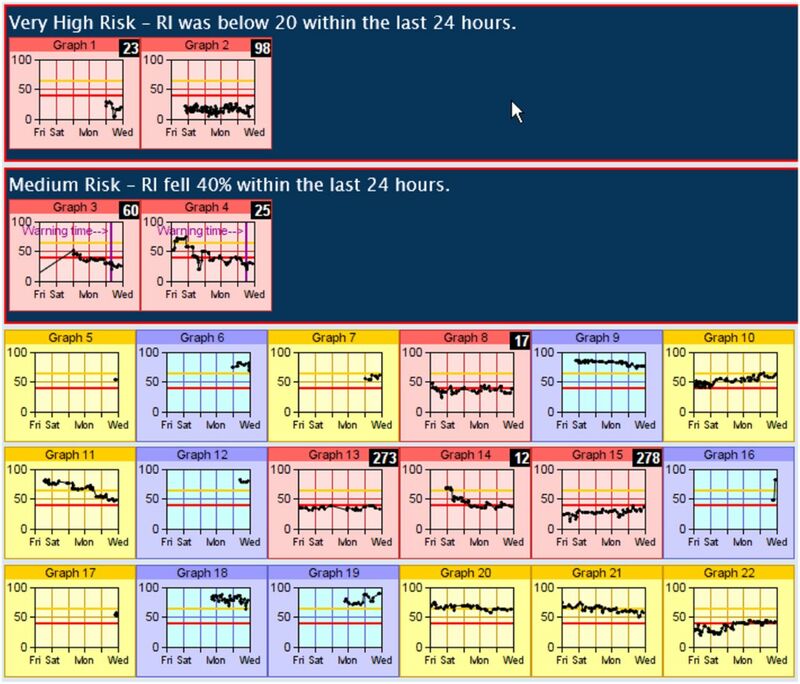 A typical array of RI Graphs which a SWAT nurse would view. Each box is a 5-day view of a patient's acuity. The graphs are color-coded by the last RI, with red being the highest acuity. An RI of 100 is for patients who are unimpaired. Lower numbers indicate greater risk. The top rows are for patient graphs where RI had either fallen below a critical number, or had fallen a certain percent in a given time period.